Pretty Little Liars returns to ABC Family tonight for the eighth episode of season five. Tonight’s episode is called “Scream for Me” and the Marins take in Alison while her father is out of town, leading Hanna to drink more heavily. Meanwhile, Aria proves to be a neglectful maid of honor to her mother; and Spencer and Emily attempt to identify the dead girl in Alison’s grave. Check out our spoilers for episode 9 right here after the show! On the last episode, Aria began her volunteer work at Radley and quickly got down to business finding any answers she could about a patient of interest to the Liars. But she quickly hit a snag when she came across an aggressive patient that may have been the key to what the Liars were looking for. Also searching for answers, Spencer took a note from Ezra’s play book by borrowing some of his spy equipment to keep a closer eye on the home front. Meanwhile, Hanna was caught at odds when Ali and Caleb butted heads, and Emily seeked help from her friends when her mom invites Ali over for dinner. Did you watch the last episode? If you missed it we have a full and detailed recap, right here for your enjoyment. On tonight’s episode Hanna’s insecurities and current situation continue to plague her when Alison moves into the Marin house while her Dad is out of town. Now forced to live with the one person she is trying to avoid, Hanna retreats further into abusing alcohol and ends up in a sticky situation. Meanwhile, Aria drops the ball on her maid of honor duties when Ella returns to town to plan her wedding and Spencer and Emily pursue a dangerous lead, trying to solve the mystery of the dead girl in Alison’s grave. The eighth episode of season five’s PRETTY LITTLE LIARS is going to be really exciting and we’ll be recapping it for you right here. In the meantime hit up the comments and tell us who you think is really A! Hanna is a hot mess, she goes to her locker and a beer can falls out of her locker. Emily and Spencer urge her to get it together, and remind her she needs to apologize to Aria for blowing up her spot at The Brew to Sidney. Aria runs in to her mom in front of school and Ella asks her to be her maid of honor in a wedding, she made them an appointment at the Bridal Shop after school. Hanna calls Caleb because he is supposed to be meeting her for lunch, but Caleb is still in bed. Alison finds Hanna in the quad and Hanna apologizes to her for how she acted at Emily’s dinner. Alison says her dad is going out of town for four days, and she wants to stay at Hanna’s house. Hanna says she will talk to her mom. At home Spencer is showing Toby the pictures that Bethany Young drew of Mrs. DiLaurentis, and filling him in on what they have learned about Radley. Toby informs Spencer that he is going to work on figuring out what really happened to his mother “from the inside.” He reveals that he joined the Police Academy. Spencer is furious he did it without telling him. But Toby argues that the police in Rosewood are useless, and his friends and family need someone on the inside that can protect them. Aria arrives for her community service at Radley, she searches the building for Eddie Lamb. One of the nurses reveal to her that yesterday was his last day, and she has no idea where he went. Aria tries to sneak Bethany Young’s sketchbook under the mattress where she left it, but she is caught by Rhonda. Aria tries to rush off but she won’t let her, Rhonda says she will forget that she saw Aria there, but it is going to cost her. Hanna arrives at home and finds Alison in the kitchen with her mom. Ashley sends Alison upstairs to take a hot bath while she cooks some dinner. Hanna informs her mom that she won’t be eating dinner with the and leaves to get drunk with Caleb. At Radley Aria bribes Rhonda with chips and soda. Rhonda reveals to her that Mrs. DiLaurentis used to sign Bethany Young out of Radley for visits and buy her gifts. She even bought her a pony at the stables. Aria asks Rhonda why Mrs DiLaurentis bought Bethany gifts, but the nurse walks in and interrupts, yelling at Aria to get out. Hanna goes to The Brew for a sandwich, but Zack has already close early to set up for his and Ella’s engagement party tomorrow. He knows that Hanna is drunk and says “he can keep a secret if she can.” He starts rubbing Hanna’s back and looking at her like a creep and she grabs her sandwich and leaves. Sydney pays Emily a visit at her house and asks if she is going to accept the assistant coaching position. She had a shirt made for Emily that says “Coach” on it. She mentions something to Emily about when she was in New York, and Emily catches her in a lie. Earlier she had told Emily that she didn’t remember anything Hanna said about New York. She tries to cover her tracks and says her “brain is mush” form being under water so much. Ella barges in on Aria at home, and demands to know why she blew off the maid of honor meeting at the bridal shop. Ella thinks that Aria blew it off because she doesn’t want her to get married again. Ella agrees to reschedule the meeting, and warns her not to miss it. Hanna is getting drunk with Caleb at his house, and wants him to driver her home. He says that he can’t drive because he is too drunk and says she has to call a cab. He tries to get her to spend the night with him but she insists on going home. At school the next day Hanna shows up late, she says that she fell asleep in Caleb’s car. She has a crispy treat stuck in her hair, and Emily tries to help her take it out. Hanna confesses to Emily and Spencer that she had a “weird moment” with Zack last night. They think that she was drunk, but Hanna thinks she should say something to Aria. It’s thunderstorming and the house is dark, Ashley finds the kitchen window open. She hears floorboards creaking and sees someone run through the house. When Alison comes downstairs, the intruder runs out the backdoor and dropping their knife on the kitchen floor. Ashley calls 911. Detective Tanner shows up at the Marin house and questions Alison and Ashley. While she is giving Det. Tanner the third degree, Ashley interrupts and tells her to stop treating her like a criminal instead of a victim. Hanna shows up on Aria’s doorstep dripping wet. She reveals to Aria that Zack hit on her and wanted to hook up with her. Aria turns on her and says that it is “all her fault and Hanna is always the problem.” She tells Hanna if she wants to spiral out of control, more power to her, but she isn’t going to bring her mom down with her. Hanna storms out. Spencer and Emily are snooping around the stable after hours. Spencer finds her sister Melissa’s riding helmets hanging in one of the stalls. While they are looking at the helmet, someone in black locks them in the stall and chains the gate. The horse next to them begins trying to break down the wall of the stall, they manage to escape in the knick of time. Spencer heads home and ices her eye from where she got kicked by the horse. Toby shows up and Spencer fills him in on finding Melissa’s riding helmet at the stable. Spencer thinks that “A” might have put it there to throw them off the Bethany Young trail and frame her sister. Spencer tells Toby that she is sorry for getting upset with him earlier, and she supports him becoming a police officer. Aria, Zack, and Ella are making flowers out of tissue papers for the engagement party. Aria says she is going to go up to bed, but Ella convinces her to watch a movie with her and Zack. 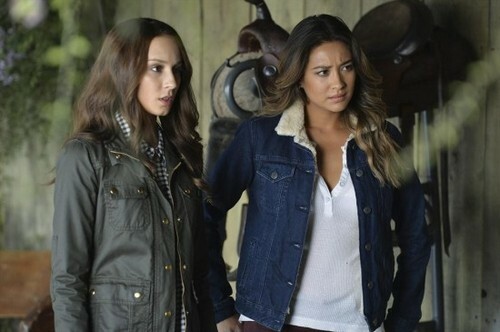 Emily and Spencer rush to Alison’s side after they learn what happened at the Marin house. Alison confesses that she told Noel to break in to the Marin house and scare Ashley so that Ashley believed someone was really after her and thought her kidnapping story was legit. Emily and Spencer are shocked that Alison took her schemes to another level and created another lie.